Olympic gold medalist Jordan Burroughs made an appearance at his high school alma mater Winslow Township High School in New Jersey this past week. The face of wrestling answered questions for about ten minutes talking about his favorite move, when he started, and about his career in wrestling. Burroughs was full of smiles while visiting his old high school and it was visible how his love for his home has never wavered. 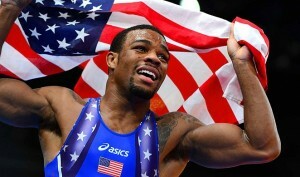 Jordan Burroughs is a Camden, New Jersey native and started wrestling when he was a young five years old. Winning started early for Burroughs as he won a state championship and senior national championship when he was finished at his high school, Winslow Township High School. After high school, Burroughs went on to star at the University of Nebraska. While at Nebraska, Burroughs was a three time All American and a two time undefeated national champion. Burroughs finished at Nebraska with a whopping record of 128-30 which is fifth in Nebraska school history. Following his senior year at Nebraska in which he won a national title, Burroughs won a freestyle world title in Istanbul, Turkey. The world title in Istanbul made Burroughs only the fourth wrestler ever to win a national title and world title in the same year. In 2012, the following year, Burroughs made his first appearance at the Olympic Games in London, United Kingdom. Burroughs finished the Olympic Games with a gold medal and has since won multiple world championships around the world. This past week, Olympic gold medalist, Jordan Burroughs made an appearance at his alma mater Winslow Township High School. The appearance was great for the kids that look up to Burroughs as an idol and as Burroughs stated had a larger crowd than most of his wrestling meets ever did while at Winslow. If your company is interested in finding out availability and booking fees for an Olympic gold medalist such as Jordan Burroughs or other sports celebrities for a Keynote Speech, Fundraiser Event, Guest Appearance, or Football Camp, call us at 1-888-246-7141.